Reading and share top 25 famous quotes and sayings about Educational Excellence by famous authors and people. Browse top 25 famous quotes and sayings about Educational Excellence by most favorite authors. 2. "It is only through raising expectations and striving for excellence that our children can reach their full potential." 3. 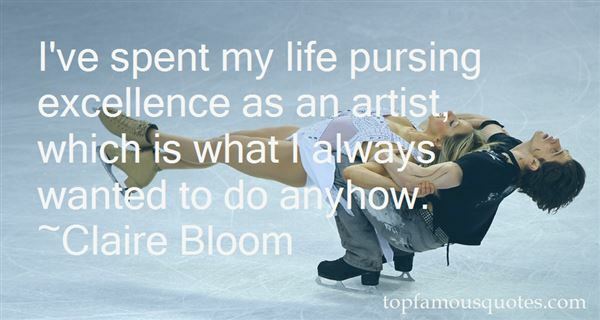 "I've spent my life pursing excellence as an artist, which is what I always wanted to do anyhow." 4. "There is no real excellence in all of this world which can be separated from right living." 5. "I grew up between the two world wars and received a rather solid general education, the kind middle class children enjoyed in a country whose educational system had its roots dating back to the Austro-Hungarian Monarchy." 6. "The envy of excellence leads to perdition; the love of it leads to the light." 7. "Badness you can get easily, in quantity; the road is smooth, and it lies close by, But in front of excellence the immortal gods have put sweat, and long and steep is the way to it." 8. "Universal education through schooling is not feasible. It would be no more feasible if it were attempted by means of alternative institutions built on the style of present schools. Neither new attitudes of teachers toward their pupils nor the proliferation of educational hardware or software (in classroom or bedroom), nor finally the attempt to expand the pedagogue's responsibility until it engulfs his pupils' lifetimes will deliver universal education. The current search for new educational funnels must be reversed into the search for their institutional inverse: educational webs which heighten the opportunity for each one to transform each moment of his living into one of learning, sharing, and caring. We hope to contribute concepts needed by those who conduct such counterfoil research on education--and also to those who seek alternatives to other established service industries." 9. "I personally developed the Academy training program. All our training is based on solid educational principles. We present the material in four training formats: lecture, demonstration, drill, and implementation." 10. "And there was, in those Ipswich years, for me at least, a raw educational component; though I used to score well in academic tests, I seemed to know very little of how the world worked and was truly grateful for instruction, whether it was how to stroke a backhand, mix a martini, use a wallpaper steamer, or do the Twist. My wife, too, seemed willing to learn. Old as we must have looked to our children, we were still taking lessons, in how to be grown-up." 11. "...as long as we have the choice to read what we want, I suspect Twain and Homer and the rest will always be with us. The stoutest old writers ebb and flow in popularity; tastes and political correctness and educational trends also ebb and flow, and we have a tendency to embrace the short view because it makes better news stories. So the joy of literature may not be at a high water mark right now, and yet you can walk into the Target store of your choice and pick up Catcher in the Rye. Beauty floats, I guess, along with sorrow and hope. (http://www.wab.org/events/allofroches...)"
12. "True sportsmanship is excellence in motion!" 13. "Generally places that are comfortable with excellence don't call themselves centers of excellence. Has anyone heard of a Princeton University Center of Excellence? Memorial Sloan-Kettering Cancer Center of Excellence?" 14. "We have been deformed by educational and religious institutions that treat us as members of an audience instead of actors in a drama, so we become adults who treat democracy as a spectator sport." 15. "Olympism seeks to create a way of life based on the joy found in effort, the educational value of a good example and respect for universal fundamental ethical principles." 16. "Jamaica is more than just the 'brand' the world recognizes so well; it's a place of pride for the people who live here, its educational institutions, its sports achievements, its science and technology growth." 17. "Get ready the greatest new educational facility at the approximate dynamic population center of the North American continent"
18. "Simply stated, earth is a school-a divine educational process custom-fit to each of us." 19. "All human excellence is but comparative. There may be persons who excel us, as much as we fancy we excel the meanest." 20. 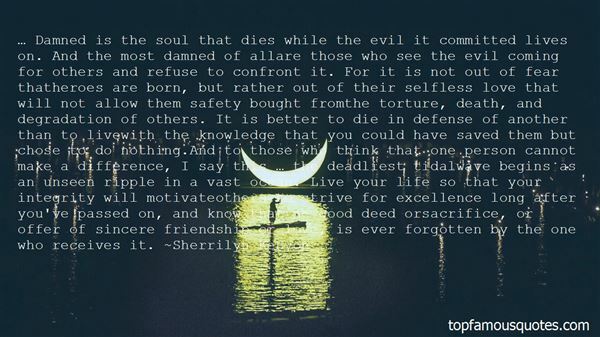 "… Damned is the soul that dies while the evil it committed lives on. And the most damned of allare those who see the evil coming for others and refuse to confront it. For it is not out of fear thatheroes are born, but rather out of their selfless love that will not allow them safety bought fromthe torture, death, and degradation of others. It is better to die in defense of another than to livewith the knowledge that you could have saved them but chose to do nothing.And to those who think that one person cannot make a difference, I say this … the deadliest tidalwave begins as an unseen ripple in a vast ocean. Live your life so that your integrity will motivateothers to strive for excellence long after you've passed on, and know that no good deed orsacrifice, or offer of sincere friendship or love, is ever forgotten by the one who receives it." 21. "A child's slowness in any subject indicates a deficiency in his environment, educational or otherwise." 22. "You unlock the door to greater levels of excellence and success when you accept who you are. It is from the point of acceptance that we can create a masterful life." 23. "The past is an educational toy for the present. It should be discarded the moment its usefulness is outgrown." 24. "Vision is dandy, but sustainable company excellence comes from a huge stable of able managers." 25. 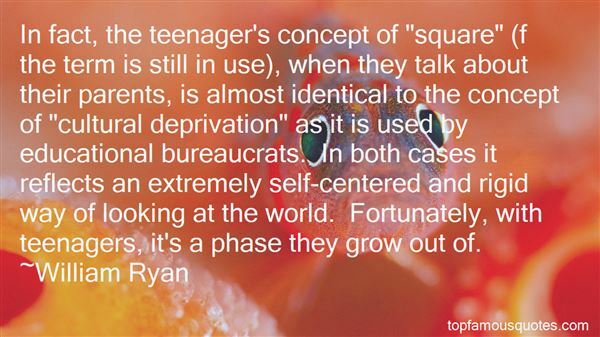 "In fact, the teenager's concept of "square" (f the term is still in use), when they talk about their parents, is almost identical to the concept of "cultural deprivation" as it is used by educational bureaucrats. In both cases it reflects an extremely self-centered and rigid way of looking at the world. Fortunately, with teenagers, it's a phase they grow out of." But we're not supposed to talk anything besides football."